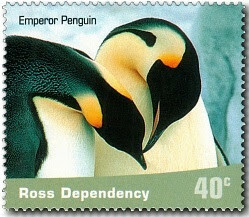 The 2001 Ross Dependency stamps, issued on the 7th November 2001, featured penguins found in the Ross Dependency area. 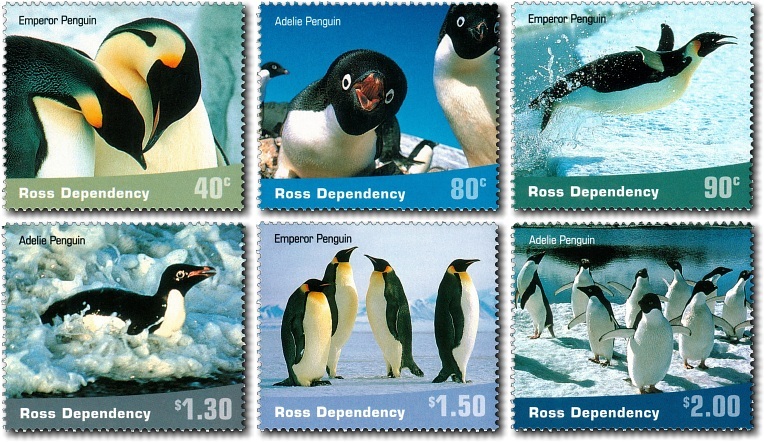 On the same day New Zealand also issued a set of six stamps, also featuring penguins, 2001 Penguins. but this time penguins from around New Zealand. There have been occasions when these two sets have been confused but it must be remembered that they are independent of one another, released by two different postal administrations. 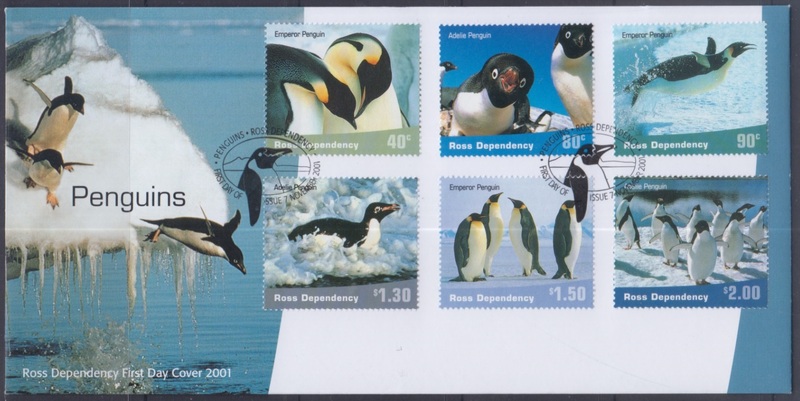 But it also must be acknowledged that these two stamp issues are also linked, through their designer, their printer and their subject of penguins. 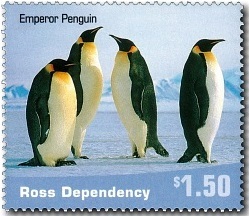 The six value Ross Dependency Penguin issue. 40c - Emperor Penguin, mating pair. They have only one mate each year, and stay faithful to that mate however the short period of the mating season will often mean the need to mate is greater than the need to wait for the appearance of last years partner. 80c - Adelie Penguin, with growing chick. Adélie penguins breed from October to February on shores around the Antarctic continent. Adélies build rough nests of stones. Two eggs are laid, these are incubated for 32 to 34 days by the parents taking turns (shifts typically last for 12 days). The chicks remain in the nest for 22 days before joining crèches. The chicks moult into their juvenile plumage and go out to sea after 50 to 60 days. 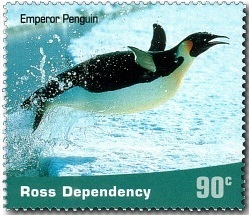 90c - Emperor Penguin, jumping from the water. An efficient swimmer, the emperor penguin exerts pressure with both its upward and downward strokes while swimming. The upward stroke works against buoyancy and helps maintain depth. Its average swimming speed is 6–9 km/h (3.7–5.6 mph). On land, the emperor penguin alternates between walking with a wobbling gait and tobogganing—sliding over the ice on its belly, propelled by its feet and wing-like flippers. Like all penguins, it is flightless. 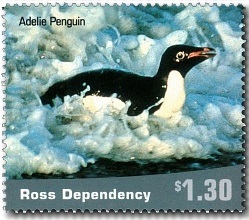 $1.30 - Adelie Penguin, on sea ice. Adélie penguins living in the Ross Sea region in Antarctica migrate an average of about 13,000 kilometres (8,100 mi) during the year as they follow the sun from their breeding colonies to winter foraging grounds and back again. "Follow the sun" means that during the winter the sun doesn't rise south of the Antarctic Circle, but sea ice grows during the winter months and increases for hundreds of miles from the shoreline, and into more northern latitudes, all around Antarctica, so that as long as the penguins live at the edge of the fast ice, there will be sunlight. As the ice recedes in the spring, they remain on the edge of it, until they are once again on the shoreline during a sunnier season. The longest treks have been recorded at 17,600 kilometres (10,900 mi). $1.50 - Emperor Penguin standing tall. 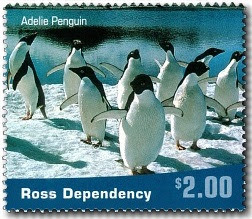 $2.00 - Adelie Penguin, group beside the ocean. The Adélie penguin (Pygoscelis adeliae) is a species of penguin common along the entire Antarctic coast, which is their only residence. They are among the most southerly distributed of all seabirds, along with the emperor penguin, the south polar skua, the Wilson's storm petrel, the snow petrel, and the Antarctic petrel. They are named after Adélie Land, in turn named for Adèle Dumont D'Urville, the wife of French explorer Jules Dumont d'Urville who discovered these penguins in 1840. Now this is an interesting item. 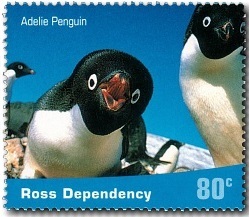 Here is a Ross Dependency FDC envelope with a New Zealand stamp. 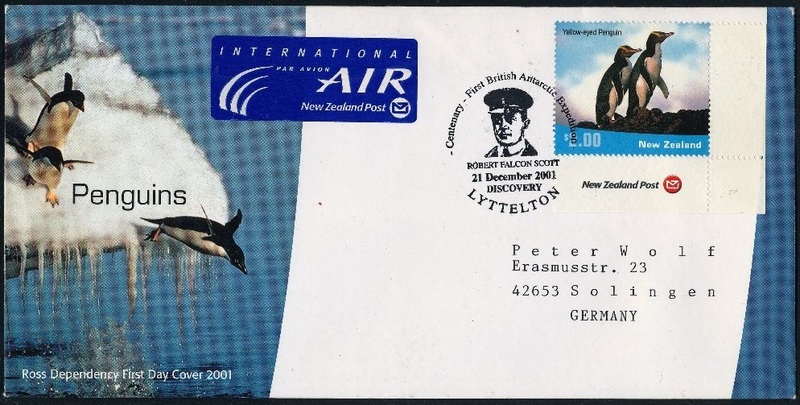 While both sets were issued on the same day, 7th Nov 2001, this is not a first day cover. Notice the date on the cancel 21st Dec 2001. This is a special cover making the centenary of the Robert Falcon Scott's first expedition to Antarctica, the British National Antarctic Expedition.